First up is the Arrow/Flash spinoff Legends of Tomorrow, the first superhero team TV show of the modern era, debuting midseason. 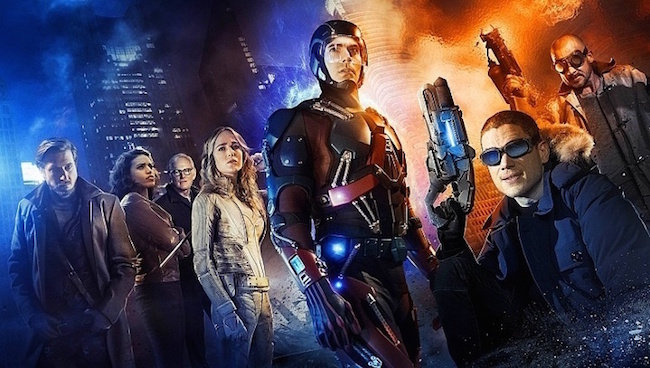 Rip Hunter, time traveler (appropriately played by Doctor Who‘s Arthur Darvill) and member of the Time Masters, will assemble a motley group, consisting of, from Arrow, the Atom (Brandon Routh) and White Canary (Caity Lotz, the first, deceased Black Canary), and from The Flash, Captain Cold (Wentworth Miller), Dr. Martin Stein (Victor Garber), and Heatwave (Dominic Purcell). Plus, we’ll have new characters Hawkgirl (Ciarra Renee) and Jay Jackson (Franz Drameh – who? still tbd). Together, they’ll fight the immortal Vandal Savage. Next comes the launch of Supergirl. This trailer gets so much right, from using Kara’s relative youth as an asset (in keeping her optimistic and determined) to a fabulous cast — including Laura Benanti as Mom, Mehcad Brooks as James Olson, Chyler Leigh as her sister, and Calista Flockhart as bitchy boss Cat Grant. Melissa Benoist does a great job balancing all the needs of the character, and I’m looking forward to seeing a full episode. Supposedly, it’s going up against Gotham, a show I’m not watching anyway. That’s direct counter-programming, and I hope the happier superhero doesn’t lose out to yet more darkness. I’m also glad to hear that Agent Carter has been renewed. It was touch and go, but I really liked this show, and I hope more of you check it out next season. Hayley Atwell’s spy Peggy is a terrific character. In other news, while Constantine is cancelled — but not completely dead yet, as pickup rumors swirl around other options — Fox is taking a chance on Lucifer, another Vertigo property. The LA club scene setting is intriguing, and the trailer does a good job setting up the hooks. Tom Ellis plays the retired lord of hell well, and I like the idea of him teasing out people’s hidden desires, kind of like a twisted version of Wonder Woman’s lasso. Just to round out the comic show overview, I’m still loving iZombie, by the way, and I hope many of you are watching that as well. Isn’t this a fabulous time for a comic fan to live? Of all of those, I’m only planning to watch more Agent Carter (which was stellar). I’m glad Legends of Tomorrow and Supergirl are following Flash’s lead in not being grimdark like Arrow or DC’s movies, but there’s just too many other things to watch. I get my guilty pleasure kicks from Flash but don’t need that expanded 3x. Lucifer looked quite disappointing, though, not feeling at all like I would expect from a Gaiman-tinged series. Still, we’re all spoilt for choice with all these shows and movies. I was ignoring the “originally created by Neil Gaiman” bit for Lucifer because it seems the show creators are, too. I’m not sure a Gaiman-esque mood would work on TV, but then, I never made it through Neverwhere. That Supergirl trailer slid right past campy into goofy territory, Legends looks great tho. I still need to watch Agent Carter & IZombie, but have heard great things. The Supergirl show has me excited as it looked to actually have the hero be a real person, hanging with regular people. Something both the comics and the other superhero shows don’t do often. Great point, James. You need the normals to keep the wonder in superheroing, and as you say, lots of them give the heroes only other superpowered friends and teammates.